Very pleasant villa, tastefully fitting and furnished, newly renovated in 2014, on a hillside complex sharing a pool with three other villas. Located in the southwestern region of Peloponnese on the Greek mainland near the beautiful fishing town of Pylos. The sandy beach 800 m, Gialova village shops and tavernas are 5km. The airport at Kalamata is only 50 km and Athens is a reasonable drive also 280 km (mostly motorway). 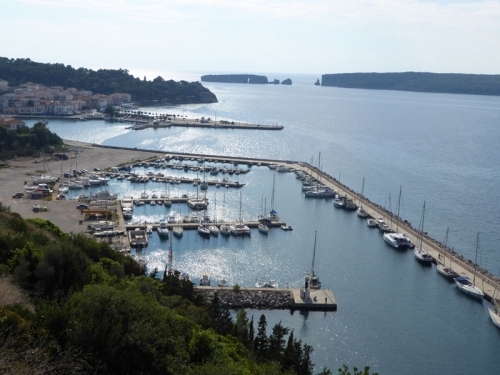 Pylos 50 km. The accommodation comprises a living and dining room with television and a fully equipped, open-plan kitchen, with access to the balcony terrace which commands fantastic sea views. Double bedroom and a twin bedroom (2 x 90 cm wide beds), shower room and toilet. There is a private garden area and you have a portable barbeque at your disposal on request. The shared has sun loungers for relaxing. Note: we have two practically identical villas with the same specification, the photographs are of one, you can expect something similar. Arrival and departure only on Sundays.